What follows is a random roundup of recent events related to token/coin/militaria collecting that made an impression on me. Also, some suggested reading and random thoughts. There was a coin show in Arlington, Texas on 5 Feb. 2000, which had a good turnout of dealers and buyers. Tokens were available in moderate numbers, and I was able to buy a few. I saw two other token collectors there. It appears that this short snorter was signed by members of the crew of an aircraft of the US Army Air Corps "Air Transport Command". The ATC was first called the Ferrying Command, and used early in the war to ferry US built aircraft to England under the Lend-Lease from factories on the west coast. They flew aircraft across the Atlantic in 1941, and the organization was renamed Air Transport Command in 1942. The ATC was responsible for all ferrying and transportation tasks except those required for combat operations. About 90% of the ATC's flying in 1942 was military contract flying by commercial airline crews. By the end of the war in 1945, 81% of the ATC flying was by military crews. Also acquired at the same show, were some inexpensive Japanese occupation notes, which were sent to a friend in Japan. 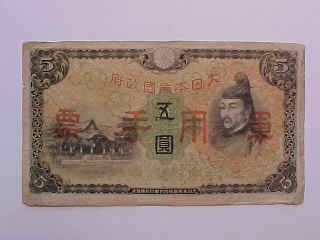 A third Japanese note of wartime vintage was acquired the same week. 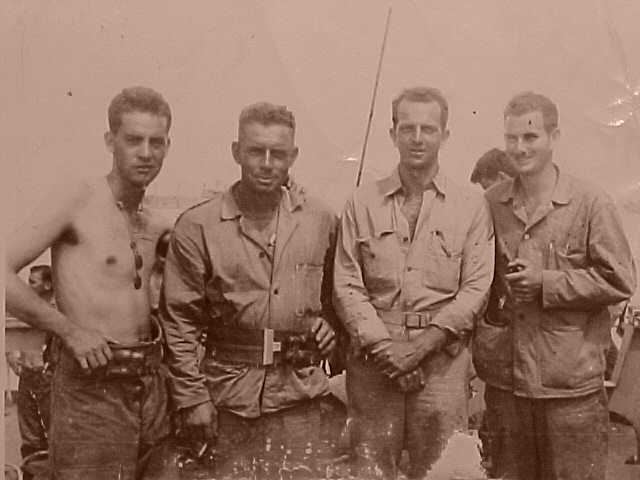 Complimenting the above items, is a small photograph, recently acquired, of four U.S. soldiers of World War Two vintage, on the back of the photograph is handwritten in ink: PFC ASHTON, CPL. NELSON, CPL. MORRIS, YOURS TRULY. TAKEN ABOARD SHIP BEFORE SAIPAN INVASION. Historica note: the invasion of Saipan by American forces, involved one Army and two Marine divisions, and began on June 15, 1944. The invasion was costly in American lives, and the island was not declared under American control until July 9, 1944. The Japanese continued to fight from caves and the hills on Saipan for months after the July 9th date. By November 24, 1944, the first B-29 bombers took off from Saipan to bomb Japan. My father-in-law served on Saipan and Tinian during the war when he was 19 years old. Saipan, is in the Mariana Islands in the Pacific Ocean, directly south of Japan, and just east of the Philippines. Other nearby islands are Guam, and Tinian. Recommended reading: "All The Best Rubbish" by Ivor Noel Hume, 1974, out of print, can be found on the web in out of print book web-sites. The book is the views of an Archeologist who is also a collector! Mr. Hume is still writing, and his words and thoughts are rich and wonderful! Other books by Mr. Hume include: A Guide to Artifacts of Colonial America, The Virginia Adventure, Martins Hundred, Here Lies Virginia, and Historical Archaeology. Recommended reading for Saloon and Western studies: Hells Half Acre, by Dr. Richard F. Selcer, 1991, available in soft and hardback versions. Dr. Selcer goes into great detail concerning the early saloons and wild west as it occurred in the frontier town of Fort Worth. Great book, great resource! As the words to the song Dixie say, "old times there are not forgotten." Let us not forget our past, and be good custodians of historical items. The following photgraph is of a Japanese bayonet, scabbard and frog, marked with the symbol of the Koishikawa (Tokyo) arsenal, same mark later used at Kokura Arsenal. 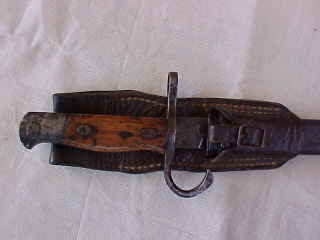 Bayonet was captured during World War II.